A bunch of enhanced sharks go AWOL at a scientific research facility, feasting on the flesh of mad scientists. That's the basic concept behind "Deep Blue Sea", starring Stellan Skarsgård and Samuel Jackson, among others. Poor Jackson is caught and eaten by two jumbo-sized makos in a classical scene. 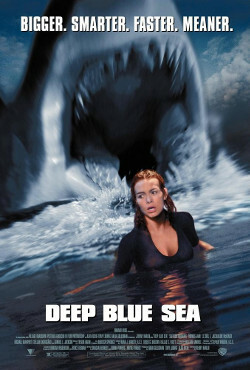 Otherwise, "Deep Blue Sea" is just too long and too boring. But then, I didn't like "Jaws" either. One thing's clear though: the unsung heroes of this story didn't have time ordering sushi, LOL.